Payoneer is one of the most popular money transfer platforms which lets you transfer money with ease. Reasonable fees, although not very low. Very Simple Interface and easy to use. Live Chat, Knowledge Base and Community. Faster and reliable then any other alternative. US Virtual Bank Account150+ Currencies. Highly secure and easy to use. Available as Payment method is popular companies. Customer Support is not very good. If you want to know the Payoneer Sign Up process, or you want to Get Free $25 Bonus. Then you are at right place because I will guide you how to get a Payoneer account and earn 25 Dollars and will provide you step by step procedure on how to sign up Payoneer account. You want to Sing Up for Payoneer. I am happy that you want to Sign Up for Payoneer account because there are many benefits of Payoneer. Whatever you are a freelancer or a webmaster or an SEO expert or a Blogger you need to receive money at the end of your hard work. And Payoneer is the best method to get your payments in your hand without any tension all you need to do is to sign up for Payoneer. ​What is The Biggest Benefit of Payoneer Sign Up? What Are Fees of Payoneer? 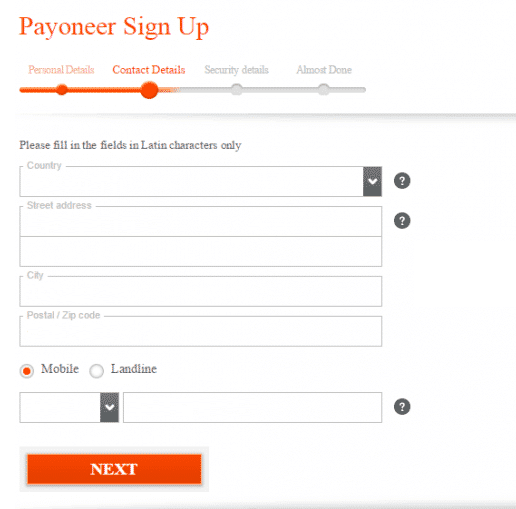 How To Activate Payoneer Account? 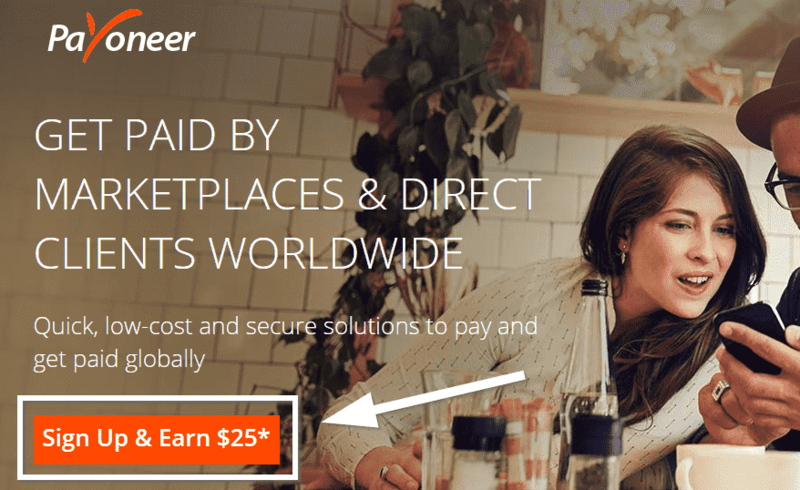 How to Get $25 Bonus of Payoneer? Payoneer is the best payment solution provider the reason for which they are best is not that they provide us a bonus of $25 (More on this below). Instead, the reason is they are really best because they provide the best service I mean they don’t take the fees of currency conversion, and there are also many other benefits too that is why I am happy to share Payoneer with you. Most of the people think that they cannot receive money from the internet without a bank account. I also used to think the same but when I come to know about the Payoneer I started searching How to Get Free Payoneer Account, and I immediately signed for the Payoneer and started receiving my money from the internet. The best thing is that I didn’t use a bank account to receive my money. Instead, I use Payoneer Account, and most of the people don’t know. ​So let’s start this tutorial. Payoneer is a payment solution company which provides online accounts to its users. The users can receive funds to their and can withdraw their money from any countries' bank account. ​Payoneer was founded back in 2005, and it is a financial service business that provides the facilities to send and receive money all over the globe (about in 200 countries). The headquarters of Payoneer is in New York City. Payoneer was founded by Yuval Tal who is the CEO of this company at the present time. There are many advantages of using Payoneer, but the most significant benefit of Payoneer Sign Up is that if you don’t have a bank account, then you can still use Payoneer to receive money from all over the world. You just need to signup for Payoneer Prepaid Account and can withdraw money from any ATM machine at any place in the world. ​As I have described it many times that there are many advantages of Payoneer and also have described the biggest advantage of the Payoneer. But there are still some more benefits of Payoneer which you should know. So, these significant benefits of Payoneer are described below. You can receive your money in you Payoneer from freelancer sites like Fiverr, Freelancer, Up Word and much more. Moreover, you can also get payments from the US-based organization like Clickbank, Shareasale, etc. You can not only receive the money you can also send money to your clients. You can buy online products too and can pay using your Payoneer. If you want to have a bank account in the US, then you can also have one by creating a virtual bank service in your Payoneer account. The most striking feature of Payoneer is that you can also earn money from its affiliate and Refer a friend programs. This is the most asked question on the internet even on the Payoneer Community that is Payoneer Free? Let me answer that Payoneer is neither free nor paid, unlike any other service Payoneer charges some fees from their users which are too small that you can't imagine, So, you can say that Payoneer is free because they cost only $30 for one year which is not too much. Since you will get Payoneer Sign Up Bonus of $25, then the first year fee will be just $5 for you. So, now when someone asks you the question Is Payoneer Free, then say them yes it is almost free. Below is the table which describes the Fee Structure of Payoneer. *There is a fee for transactions originated in a country outside of the country of issuance OR in a currency different than the your currency above all fees assessed. Well, Singing Up for Payoneer is as simple as making tea (It is easy to make tea). You just need to go to the website of the Payoneer and have to fill the form correctly after the submission of your Payoneer you will receive your within a few days or weeks depending on your physical location i.e. Country. Although Singing up for Payoneer is easy, you should read below guide to and you should signup from my Payoneer referral link if you want to earn $25 bonus. Step 1. First of all click below sign up button. ​Step 2. A new tab will be opened there click on Sign Up and Earn $25* button like below image. Step 3. After you click on “Sing Up & Earn $25*” Payoneer will ask you that whether you want to receive money in you Local Bank Account. You can choose Local Bank Account if you want your payments direct into your Bank Account which you have to link there after sign up process. Step 4. 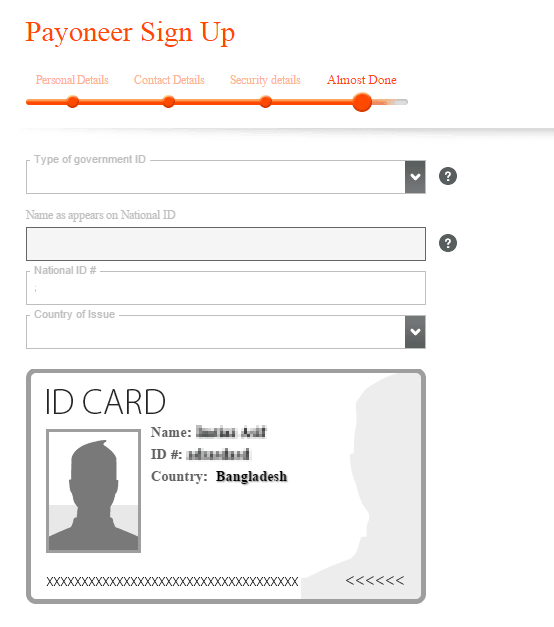 Now you will see a Payoneer Sing Up form which you have to fill with your correct information. So, there you have to enter your First name, Last name, Email, and Date of Birth. After filling the form click on Next button. Step 5. The next step is to provide your Contact Details. This is very important because if you type anything wrong, you might not get your Payoneer. So first enter the name of your Country, Then Street Address. Then enter your City name and Postal / Zip Code (if you don’t know your postal code then search the Google). Finally, you have to enter your Mobile Number. Step 6. Here it comes the security. Payoneer safety is very important, so they secure you from unwanted accesses. That’s why here in this Payoneer Sign Up page you have to enter the Security details. These details include your Username, Password, and a Security question. Step 7. 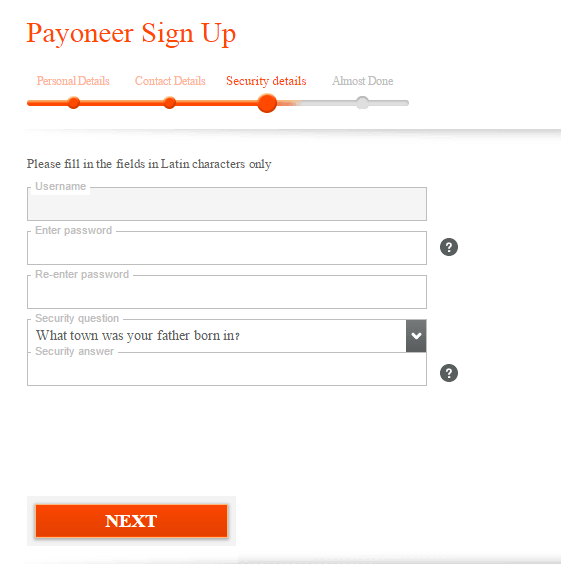 Now here is the final step of the Payoneer Sign Up process. In this page, you have to enter your details as per on your ID. So, select the type of your Government ID, Name as on your Nations ID, Notional ID# and Country of Issue. All these details will be available on your ID provided by your country. Step 8. 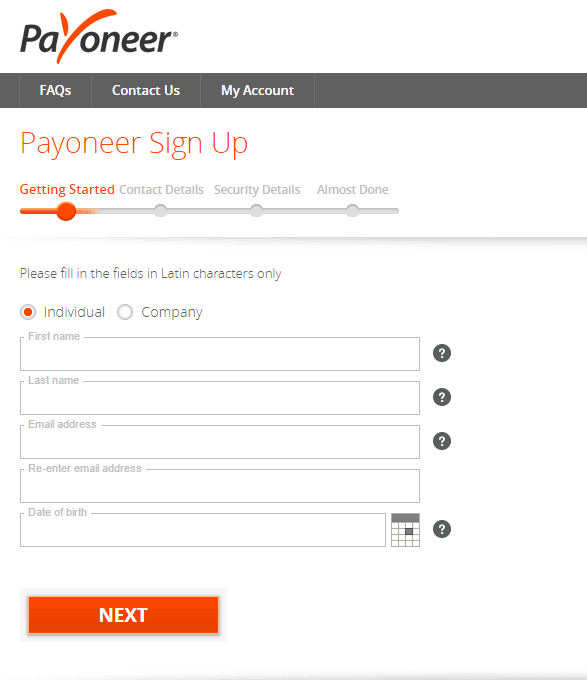 Finally, here is the last step of the Payoneer Sign Up. 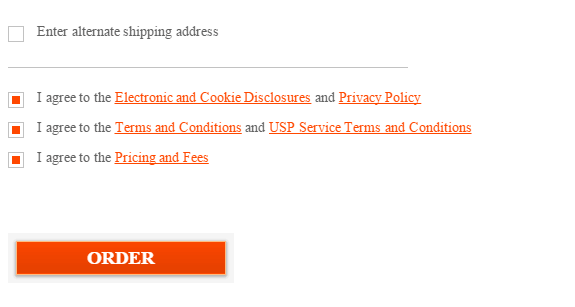 If you have an alternate shipping address, then it is good practice to add this because if something happens with your address, then your account will be automatically shipped to the new address. Now you just need to agree all the terms and conditions by ticking and the click on ORDER button. That’s it you have successfully signed up for Payoneer. Did you Find this Guide Useful, if yes? Please support us by sharing on your social networks. Again I am happy that you have received your Payoneer Account in your hand and want to activate your Payoneer Account. Well, activating your Payoneer Account is as easy as drinking water (it’s easy, is not it?) So, let’s get started. First of all, unpack your Payoneer package from the mail. And take that in your hand. Login to your Payoneer Account and click on the Activate button. After clicking the Activate button, a new page will be displayed, and there will be three fields. In the first field “16 digit number” enter the 16 digit number (without spaces) from your account in the field. After that enter a 4 digit PIN (Personal Identification Number). Make sure you remember this PIN because it will be used to get your payments from ATMs. After entering the the Number and PIN tick all agreements and finally, click Activate button. You will see a message that the operation has been performed. And you will also receive an email confirming your activation. That’s it you have successfully activated your Payoneer account and now you can receive your payments from all over the world using this Payoneer account. Yes, you can also earn a very good amount from Payoneer and the best thing is that you will earn more then 750 US Dollar without doing anything. If you are interested in earning such huge amount very easily then follow the steps described below. Making money through Payoneer is very straightforward and easy. All you need to do is to copy your Refer a Friend link and send that link to your friends. First of all, login to your Payoneer Account. Hover the mouse icon over Activity tab and select "Refer a Friend" option. In a new page, you will see an URL just copy that URL and send that URL to your buddies, and the best thing is that you and your friend both will receive a $25 bonus when your friend transfers at least $1000 from Payoneer verified companies. If you are a Blogger, then you can write a blog post on Payoneer. If you are famous on Facebook, Twitter or Google Plus, etc. then you can share that URL with your followers. Well, if you have successfully received and activated your Payoneer Account then now it's time to get your $25 bonus which Payoneer will pay you once you receive a total of $1000 to your account. If you think that you can receive $1000 from your friends through their Payoneer Account then this will not work. Because People will start spamming with Payoneer to receive $25. There are two possible ways to add funds to your Payoneer Account and receive $25 bonus. If you want to add funds to your Payoneer account and want to receive your $25 Payoneer Bonus then you can add funds to your Payoneer Account using Payoneer verified companies. ​US Payment Service is the best thing about Payoneer, if you Sign Up for Payoneer then, Payoneer provides you the US bank account which you can use to receive payments from all over the world. US Payment Service is just like that you open a bank account in the USA. To use US Payment Service ​you need to verify the Global Payment Service and submit your required documents. Withdrawing your money from your account is very easy. 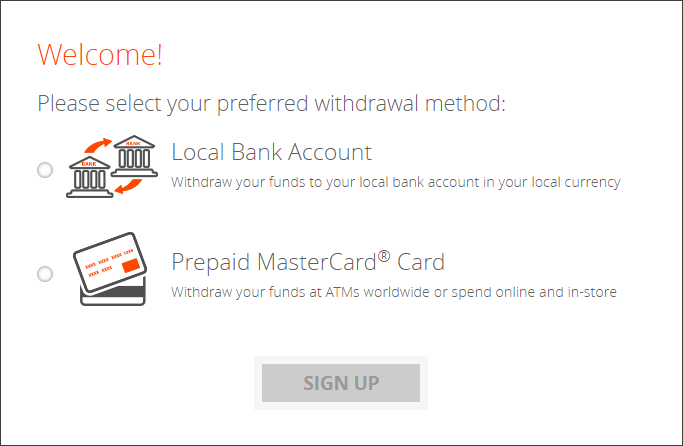 ​Well, if you want to Withdraw money from your Payoneer Account then there are two possible ways, you can either use Local ATMs or can transfer funds to your Bank Account. Withdrawing money from local ATM is my favorite way, although it's a little expensive yet I like it. It's simple; you just need to go to the nearby local Automatic Teller Machine (ATM) and enter your Account and your PIN which you will setup after activating your Payoneer Account and then the amount of money which you want to withdraw that's it. Well, if you don't want to use the ATM then transferring your money to your bank is the best way. Before moving your Money to your Bank, you need to provide your bank account details to Payoneer and have to wait for an Approval. So, let's have a look how to transfer Payoneer Money directly in your Bank. Withdrawing your money to your Bank Account is very straightforward and easy, but it takes some intention and a little bit time. As I have already described that you need to submit your Bank details to Payoneer and wait for the approval, so let's face it. First of all, you must be logged in to your account. Hover your Mouse icon on Withdraw and there select "To Bank Account." On the next page, you will see a step map and an Add new button just click on Add New button. Now you need to verify that you are the real person who is trying to add a Bank account, so enter your Account Number, CVV (Read More About CCV/CVC), Your Date of Birth, and the password of your Payoneer Account. Finally, enter the bank details where you want to deposit your money. Be careful about it, make sure that you type everything right. Now you have to wait for a few minutes (depends on your country) and Payoneer will approve your Bank Account. Once again login to your Payoneer Account and hover the mouse over Withdraw and then select To Bank Account. There choose the Account (if your account has more than one) then choose the Bank account, then amount which you want to withdraw and then write a description. Finally, click on Next button and then confirm the deposit to Bank. Payoneer will send money to your Bank account within 3 Business days. This was all about How to Get Payoneer account, if you have not signed up for Payoneer till now than you should immediately Use this Payoneer Sign Up guide and should apply for Payoneer because it is the best service ever for receiving Payments from all over the world at very cheap rates. You can also earn a good amount of money using Payoneer Referral Link. All you need to do is to spread that Referral link with the world and you will be rich in days. Whatever, I will love to listen to your stories about Payoneer. And if you have any problem about Payoneer Sign Up then you can post comments below I will be happy to assist you. My Name is Fahad, and I am a Tech Savvy Guy, I love to write about Blogging and Tech. Blogging is my Hobby which I love to do in my leisure time. Beside online world, I like to study books and learn new things. Copyright text 2017 by Bloggers Papa.